This will be the third time I have made this game (remade not just ported), and I have become exceedingly efficient at it. It is however the first time it is on PS3 and it’s back to being in 3D (though for the time being it isn’t rendering 100% correctly like it is in the above screenshot) so huzzah for that. 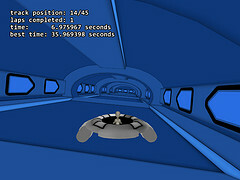 UFO Racer, as the self-explanatory title suggests, is a racing game involving extra terrestrials in hovering/flying vehicles. Some stats are displayed on screen showing how much of the looping track you have finished, how many times you have completed a lap and what the shortest amount of time you have done so in has been. Use the analog stick(s) to control the ship. I’ll be updating, fixing up and improving it as soon as I get the time but I’m really trying to get some other things done before the end of the month so I’ll be busy for the next few days.